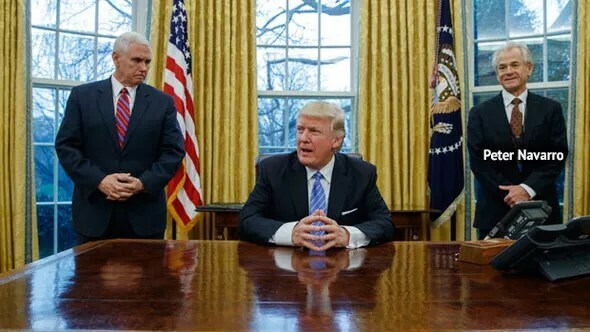 Trump shows Pence and Peter Navarro he can count to 10 — or 5 twice! ❝ President Donald Trump has a logically coherent strategy for achieving the goal of reducing the US trade deficit, one of his stated priorities. The problem is that his strategy is based on totally wrong assumptions about trade deficits. ❝ Two logical chains are leading the president and his team to erroneous conclusions. The first is based on the mistaken assumption that foreign barriers to US exports cause the US trade deficit. If that assumption were true, the strategy of trying to lower foreign barriers by threatening to raise US barriers would be defensible. But both theory and evidence demonstrate that barriers reduce exports and imports equally, with no lasting effect on trade balances…The second logical chain starts with the assumption that tariffs inflict more pain on foreigners than on domestic residents…But longstanding economic theory says that both the home country and the foreign country roughly equally bear the cost of tariffs. Tariffs raise costs for consumers and producers in the importing country. Moreover, there is no reason why the war must be fought only through tariffs. US businesses have considerably more direct investment in Chinese operations than Chinese firms have in US operations. On that front, the United States has more to lose from commercial conflict than China. RTFA. For that matter, wander on through some of the goodies published by the Peterson Institute for International Economics. Unless, that is, you prefer relying to dummies like our fake president.